What I love about cupcakes is they bake in 30 minutes and you don’t have to wait for anyone to bite into them! 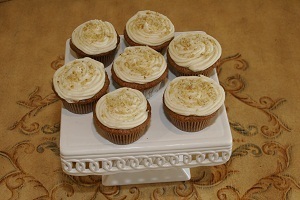 These carrot cupcakes are moist, tasty, and delicious! Sift the flour, baking soda, salt, and cinnamon in a medium bowl. Set aside. In the bowl of a stand mixer fit with the paddle attachment or a hand held mixer with twin beaters, combine the eggs and sugar. Beat on medium- high speed for 2 minutes or until mixture lightens and thickens slightly. Reduce the speed to low and add vanilla extract. Slowly pour in the oil, mixing until just blended, about 1 minute. Gradually add the flour mixture and mix until well incorporated, scraping down sides as needed. Add the carrots, pineapple, and walnuts and mix until evenly distributed. Slowly pour batter inside cupcake holders about ¾ ways up using a ¼ cup measuring cup. Bake for 25-30 minutes until toothpick inserted in the center comes out dry. Remove from oven and allow cupcakes to cool, about 10 minutes. Transfer to a wire rack to cool completely. To Make Frosting: In the bowl of a stand mixer fit with the paddle attachment or a hand held mixer with twin beaters mix the cream cheese, butter, and vanilla extract on medium speed until smooth and creamy, about 2 minutes. Reduce the speed to low and gradually add confectioners’ sugar until mixture is smooth. Fill a piping back with the frosting and frost the cupcakes starting from the outside working your way in to the center. Repeat with the remaining cupcakes and sprinkle with finely chopped walnuts. Serve immediately or cover and refrigerate until ready to serve.